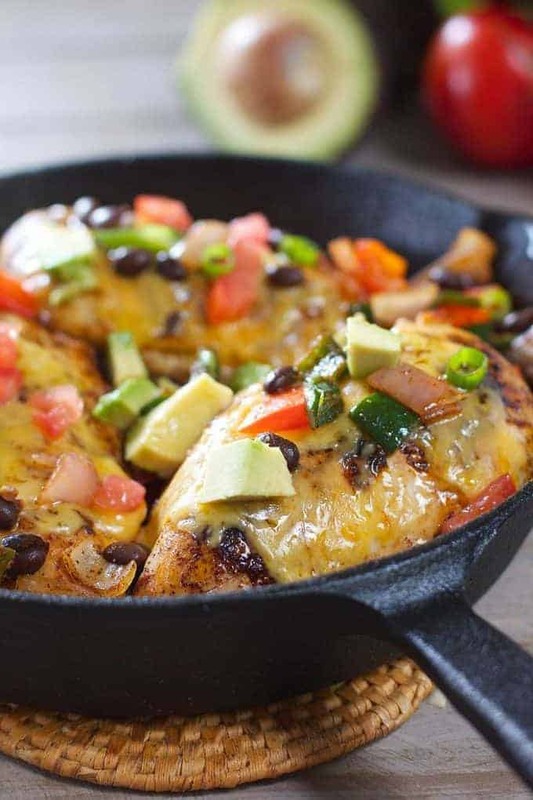 Tex Mex Chicken Skillet! This easy chicken breast recipe packs a tons of flavor and comes together in 30 minutes! 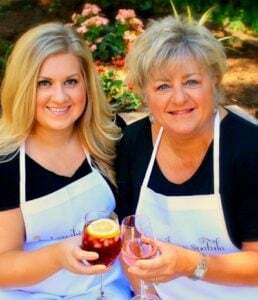 I am so excited to this share this recipe with you! 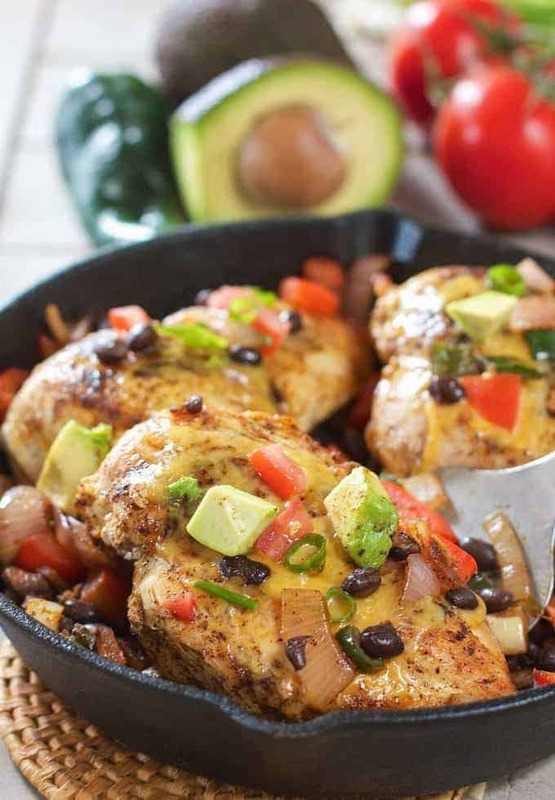 This Tex-Mex Chicken Skillet has all the fresh and easy components we love around here! 30 minutes, one skillet and you have an over the top dinner on the table. Chop the leftovers up and add them to your salad for lunch tomorrow! There are times I think we are gonna grow feathers and cluck around here, we eat so much chicken. But it’s easy. It’s cheap. It’s versatile. And my freezer seems to be full of it all the time. 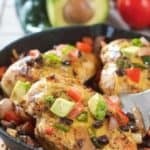 How to make this easy Tex Mex Chicken Skillet Dinner! For this fresh, fast and simple recipe, I mixed up a coupla teaspoons of cumin, chili powder, garlic and salt. Hey, guess what? You just made homemade taco seasoning! I sprinkled a bit on the chicken and added the rest to the veggies. I used my beloved poblano peppers in this dish which have a touch of heat. Most folks have no problem with them. But if you prefer, a green bell pepper would be just as good. This came together so quickly I didn’t take a bunch of photos but this is so easy…you got this! 1.) Sear the chicken and remove to plate. 2.) Chop veggies and give a quick sauté. Toss in some black beans. 3.) Add seared chicken back to pan and cook for a few more minutes. The calories are low, the protein is high, the clouds have parted and there are flavor angels singing! I love flavor angels! You can see all my Fast and Fresh meals HERE! Here are a few of our favorites…. Greek Chicken Sheet Pan Dinner – more of those good old chicken breasts and veggies all roasted on one pan with an easy marinade! Pesto and Mozzarella Stuffed Chicken Breasts – Super easy with a big big flavor! To chicken and all the possibilities! A one pan 30 minute meal that has tons of fresh flavor! Seared chicken, sauté veggies and top with avocado! 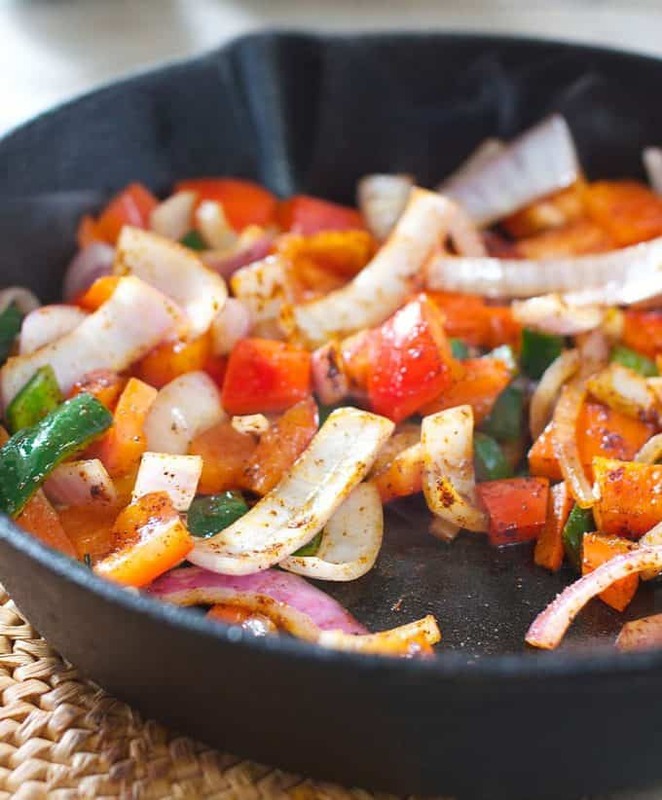 Heat cast iron skillet (or your everyday skillet) to medium high heat. Add olive oil and heat until shimmering about 2 minutes. Sprinkle both sides of chicken breasts with half the cumin/chili powder mixture, reserving the rest for the vegetables. Sear seasoned chicken. Cook about 4-5 minutes on each side until cooked through and internal temperature reaches 165 degrees. Remove chicken to platter. Saute peppers and onion until soft. About 3-4 minutes. Add drained and rinsed black beans. Sprinkle veggies with remaining chili seasoning and add chicken back to the pan. Top chicken with grated cheese and garnish with fresh avocado chunks. Loved it but needed salt!! Thank you. I never get enough Tex Mex. Love your spices and flavors! So true Ginny! Thank you for the nice comment! We love Mexican and I can see you have used so many colourful veggies here, one pot meal are always welcome in my house! I hope you get a chance to try it Jagruti! wow this looks so good, I love Tex Mex flavors and really love that this is quick and easy.. who doesn’t have 30 minutes to get dinner on. Thanks Dahn! Hows your Mom? Your blog is looking beautiful! I guess I know what would be our dinner tonight. This will be a big hit! thank you for the recipe. Thats so nice! Thank you Calleigh! I love how packed full of veggies this is and the perfect meal to ensure there isn’t too much washing up! I know! I’d do anything before I would dirty another dish LOL! This looks absolutely scrumptious. I always have those seasonings on hand, so this is the perfect mid-week dinner! Pinned. Thanks for the nice note Susan! I was just on your blog the other day and it looks fabulous!